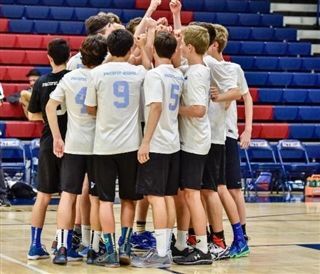 Congratulations to the Boys Varsity Volleyball Team on an amazing season that came to an end during Friday's CIF Division 4 Championship match. The Firebirds' battle against the Sage Creek High School Bobcats was intense from the start. Pacific Ridge was able to capture the first set 26-24, but dropped the second 18-25. Despite playing with impressive grit and heart, the Firebirds were unable to regain momentum in the third or fourth sets, and fell to a very tough opponent. After the team's dominance in league this year (the Firebirds didn't drop a single set during league play! ), players and fans are already looking to the future. The young team will return all of its starters next year.